Under any circumstance or by any selection criteria we (those who have been saved by grace and saw the unbounded love of God through Christ) don't deserve to be the servant of the Lord. We don't deserve to be categorized under the group of righteous people who are servant of the most fearsome God. We were very stubborn in our ways and with wicked heart and didn't listen to God all the time. If there is a man who has tested the mercy of God by going to his sins over and over again, it is me. If there is any one out there that I know who has done many wrong things in life, it is most probably me. For every wrong thing I do, I don't have too much excuse but my anger in me was eating up my flesh and soul. If you come to see a man who has lived his life all right and lead himself in the right way, probably you are making a mistake. If you are thinking right now that I might have the perfect way of life, you have found the wrong person. My life was neither perfect nor flawless. I have failed my self, men and God many times. If you come to see a man who has won all his battles, you are on the wrong address. However if you come to see a man who lived to see this day by the mercy of God, you found it. I didn t deserve to see the light of the day if is not by his mercy. I am not worthy of any of the blessings that God has for his children because of my stubbornness. I was not able to seek the face of God as my hands are filthy and my life is full of sin. If you understand what really grace means, you know why I am here. But if you don t, here is one for you to see. My life was never complete before I met Jesus. My life was full of turmoil and a lot of murmuring and grumbling. My life was shapeless and meaningless before the Spirit of God gently passes through me with favor and compassion. But when he does, my dear completely changed the way I see things. I don't see now the way I used to see things. I don't murmur, complain and grumble at least as I used to. No matter how deep the cut of the wound is, I still praise the Lord for his unfailing love and everlasting mercy with all my heart. I seek his face and gaze at his promises that he will come to take me to the resting place. I know for one thing all the wounds that the devil has caused in to our lives might not completely heal in this life. But it is another thing to believe God that he is preparing a resting place for those who have been hurt so much in this world and an agonizing fire for those who have caused all the sufferings. The everlasting anointment of God pouring in to the wounds of our soul shall give an everlasting relief from everything our lives have gone through. It heals and protects our soul and gives hope for the future. We now know that if it is not by strong faith that comes from the deep revelation of the word of God and the hope that feels our heart from his promises, we might not want to see another day. When it comes to the nuts and the bolts, grace is that bit of energy which makes us live our lives with courage and strengthen us to evolve to the next step and with out even a second thought. So what is mercy then and how does love is actually related to grace? Grace is favored, unmerited, undeserved, not earned, freely given, not of good work but of good will of the father. Grace has something to do with mercy, hope, love, compassion and favor. We all exercise grace in a smaller amount from our close friends and family. Sometimes we love our children very much and we don't even take serious measures when they make very small mistakes. So grace comes out of love of our children. Same thing when God covers us with grace, he is doing it out of love and that will cover us from the wrath of God and it gives us favor to see his face even at the time when we have done some terrible mistakes that will make him very angry. Why does God want to give us favor? Because he is full of compassion and he loved us first while we were sinners. So if we were sinners and God loved us, then it is not because of our work but because of his mercy through Christ Jesus. Does this mean grace just simple makes us very disobedient in a way that we are simply covered by the blood of Jesus? No, the wrath of God is already placed on those children (not just simply unbeliever or someone else) who has repeatedly abuse the blood of the lamb and take it for granted. We don't know actually when the love of God turns in to anger and punish us for the wrong things we did. This doesn't mean we have to be punished for every little bit of sin we have made everyday. 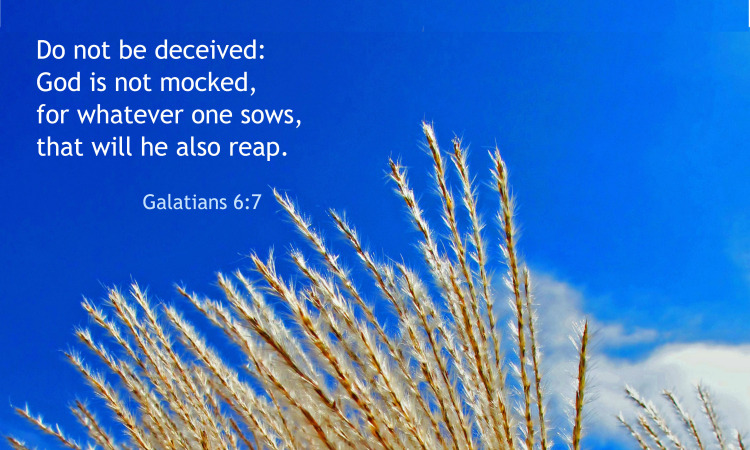 But for sure we have to know that every one reaps what he saws and God is not a man that can be mocked. The law of harvest teaches us very well that what we get is what we saw. So be careful what we saw in our lives and people lives with our mouth, actions, thoughts, inclination of our heart, prayer and motive. If we diligently saw love and peace and hope by faith, it shall come to us not only one fold but also ten times and hundred times more in return. If we saw negligence, hate, bitterness, madness, cruelty, dishonesty, mistrust, disbelief and wickedness in to our lives and the lives of others, God will pay us the wages of our labor for the bad things we did in multiple folds.